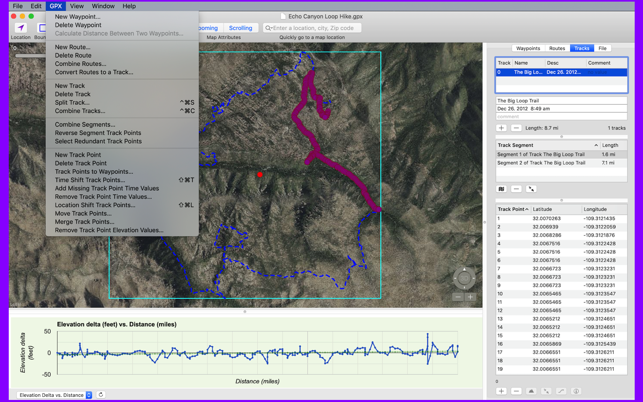 Edit GPS eXchange format (GPX) files on your Mac. GPX Editor can edit GPX files exported from many GPS devices and other apps. - Open, edit and save multiple GPX files. - View with Apple Maps or Open Street Maps. - View and edit waypoints, routes, tracks, track points, and file info. - View charts such as elevation vs. track point (when elevation exists). - Copy waypoints, routes, tracks and file info and paste to a spreadsheet. - Copy & paste waypoints, routes, and tracks from one file to another. - Show or hide waypoints and track points. - Drag waypoints and track points to a new location on the map. - Add new waypoints, routes, tracks and track points. - Get current weather for a waypoint or track point. 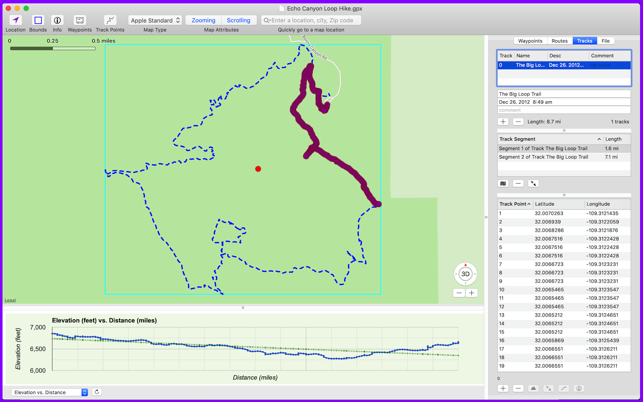 - Download elevation for any waypoint or track point. - Take a screen shot of the map for printing or reference. - Drag and drop track points to rearrange their ordering (within the track point list). - Preferences let you change pin, route and track colors and more. - Flickr search for photos and videos at any waypoint or track point location. - Delete waypoints, routes and track points to refine your GPX file. - Delete multiple track points easily. - Convert track points into waypoints. For example, you have a track from a bike ride, but you want to trim the beginning and end portions of the track. With GPX Editor it’s easy to delete multiple track points for this very purpose! Note that GPX extensions are ignored. - Fixed a bug when converting trackpoints to waypoints. - Other bug fixes and performance enhancements. Nachdem ich ein bisher zur Bearbeitung von GPX-Dateien verwendetes Java-Tool (und Java insgesamt) endlich mal loswerden wollte, habe ich mir alle Apps zur Bearbeitung von GPX-Dateien, die ich im Mac App Store und außerhalb finden konnte, angeschaut und bin schließlich hier bei GPX Editor gelandet. Da im Gegensatz zu vielen anderen Tools keine Testversion zur Verfügung steht, war ich vor dem Hintergrund der eher klassischen und unaufdringlichen Präsentation des Programms ein wenig skeptisch, bin jetzt aber hellauf begeistert. Hier liegt der Schwerpunkt eben schlicht auf einem guten und leistungsfähigen Produkt und nicht im aufwändigen Marketing. GPX Editor leistet mehr, als man sich für den sehr günstigen Preis wüschen kann – insbesondere, wenn man es mit vergleichbaren Apps für über 20 Euro oder gar mit Abo-Preismodellen vergleicht. Der Entwickler reagiert auf Anfragen schnell und überaus freundlich. Sehr zu empfehlen! Macht genau was sie soll: man kann einfach und ohne großen Lernaufwand eine Datei mit GPX Daten editieren. Ich verwende dieses Programm, um aufgezeichnete Wanderrouten zu editieren oder neue zu erstellen. Geht ganz probelos. The developer is very cooperative and added a lots of useful features in the new version. The added compatibility to OpenStreetMaps I like best. Thanks a lot for the big improvement. When I am hiking or skiing in austria, italy or somewhere else I really like to record my tracks using the iPhone (or any other handheld GPS device). It is great for sharing the track with friends or just showing them what I have done. The issue is, at the end of the week you have about hundreds of gps tracks and you need to edit and organize them. Now GPX Editor comes in. It allowes to import gpx files (tracks, waypoints, routes) and allows to merge them. It is also perfect for planning a hike or an adventure. All in all I really enjoy using the app and it does what it should do.